A fist bump is a form of greeting. To bump means ‘to collide or to come violently into contact with’ and also ‘to cause to collide.’ As an informal term, to bump is to deny a passenger his/her place on a flight or, in US English, to dismiss someone from a position or to take another person’s position. Also informally, to raise or force upwards is to bump too (in UK English, this is always used with up, but in US English you might also see it without). If a car bumps, it means that it moves with a series of jolts and rather uncomfortable shakings. As a noun, a bump is a collision or the act of colliding, and also a small raised area above a surface, particularly a swelling or raised bruise caused by a blow or collision. Informally, in US English, a bump can mean either a promotion or a demotion, or a raise in salary. A bump or baby bump is also an informal term for a woman’s belly when she is pregnant. The car bumped the curb. I bumped my knee when I fell. The flight was overbooked and the airline bumped us. Mark was bumped from the racing team to make way for a young driver who brought in several new sponsors. Increases in the cost of raw materials have bumped up the price of this product. The old car bumped along the road. George has a bump on his head where he hit it on the shelf. Karen got a pretty large salary bump and a corner office to go with her new title as vice-president of the company. speed bump: a raised strip in the road, designed to slow traffic down. 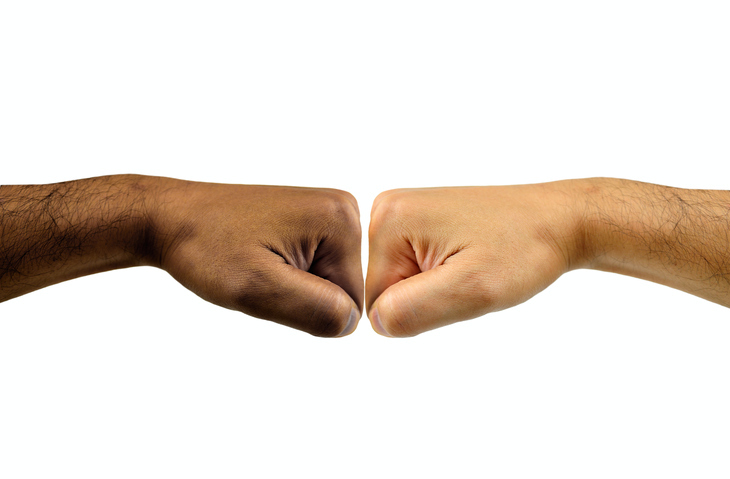 fist bump: an informal greeting where two people bump their fists together, as in the picture above. Bump dates back to the mid-16th century. The verb originally meant ‘to bulge out,’ and is probably of imitative origin (based on the idea that the original, short-lived sense may have been ‘to hit,’ and the bulging out was caused by a blow), though some researchers think it may also have been influenced by a Scandinavian word. It may also be related with the verb bum (now obsolete), which meant ‘to make a booming noise.’ The sense ‘to strike heavily or come into forceful contact with something’ appeared in the early 17th century. To bump into someone, meaning ‘to meet them by chance,’ was first used in the late 19th century, while to bump someone off, meaning ‘to kill them’ is slang from the early 20th century. The noun comes from the verb and, meaning ‘a protuberance from a blow,’ dates back to the late 16th century. The meaning ‘a dull sounding blow’ dates back to the early 17th century.